As a digital marketer these days, you could get overwhelmed with a variety of tools to choose from. Still, a life without them would be hell on Earth. They make our daily jobs a lot easier with all the metrics and stats we can get insights from, that further down the line influence future business decisions. One of the metrics that’s getting more and more recognition is sentiment analysis. And rightfully so! Now, what sentiment analysis even is? Sentiment Analysis is the process of determining whether a piece of writing is positive, negative or neutral. Simple, right? Well, not always. While sentiment analysis tools are amazing additions to the marketers’ toolkits, just like people, they sometimes make mistakes. Keep that in mind anytime you do the sentiment analysis (a.k.a. opinion mining) for your brand, product, service, or clients you work for. As you can see, this particular mention was labelled as negative, even though it doesn’t actually carry a negative meaning. However, the word guilty caused the tool to classify it as negative sentiment. Still, the ability to use sentiment analysis tools is a blessing, especially considering the amount of data that needs to be analysed in order to draw conclusions and make business decisions. The 17 best sentiment analysis tools out there – let’s have a look at them! Brand24 is a social listening tool in its essence and sentiment analysis is just one of the features you can use to your advantage. In fact, it can be used inside the different tabs of the tool’s dashboard. First and foremost, we need to take a look inside the Mentions tab. The green and red lines on the bottom part of the graph represent changes in sentiment over time. The spikes and dips make it easy to identify what were the reasons for changes of sentiment. You only want to have a look on the bright side? Easy! Clarabridge’s sentiment analysis tool is a part of their Customer Experience Management solution, which consists of CX Analytics and CX Social. They use an 11-point scale to index the sentiment of collected content. Grammar, context, industry and source are all taken into account while scoring a piece of text. We know customers are pleased when they mention how “thin” their new laptop is, but that they’re complaining when they talk about the “thin” walls in your hotel. And I take their word for it! You need to request a demo to get a quote for CX Analytics. At the same time, you can try CX Social for 14 days for free. Once this part is done, it’s way easier to state which phrases are the most interesting from the sentiment analysis standpoint. It’s vital to point out the tool puts emphasis on a variety of other factors, such as lemmatization, prior polarity, etc. You can take the tool for a free spin before you eventually decide to go for one of the paid plans ranging from $99 to $1699. OpenText Sentiment Analysis Tool is a part of a broader OpenText Content Analytics solution. It is a specialized classification that you can use to identify and evaluate subjective patterns and expressions of sentiment within textual content. The analysis takes place on three different levels: topic, sentence, and document. It’s programmed in a way so that it can recognize if the portions of text are factual or subjective. Speaking of the latter, it’s also meant to evaluate whether the opinion expressed within particular pieces of content are positive, negative, mixed, or neutral. The tool offers full support of five languages: English, German French, Spanish, and Portuguese. Similarly to other, robust tools on the list, you need to fill out a contact form in order to find out what price points we’re talking about here. ParrallelDots is an applied AI research group and the sentiment analysis tool is just one of their services. Actually, their offering can be distinguished into Products, APIs and Plugins, which is where their sentiment analysis tool falls into. Their sentiment analysis API uses Long Short Term Memory (LSTM) algorithms to classify a text blob’s sentiment into positive and negative. LSTMs model sentences as a chain of forget-remember decisions based on context. It is trained on social media data and news data differently for handling casual and formal language. This sentiment analysis tool works in 14 different languages. You can sign up for a free account and use a free forever plan which you can use to test their APIs, build MVPs or finish your personal projects. In case you need some more firepower, you can choose one of the 5 available plans priced $79-$499 as well as a custom plan. Whether you’re processing high volumes of text data, need security to run the system behind your firewall, or want to tune and configure your text analytics, Lexalytics has got you covered. First, with the use of text deconstruction and natural language processing, they brake phrases and sentences apart to evaluate semantics, syntax, etc. Lastly, structured data and conclusions are transferred into their visualization dashboards or business intelligence tools so that it’s easier for the user to conduct historical and predictive analytics. They claim lots of tools can tell you who’s talking and what they are talking about, some of those tools can tell you how those people feel, but only Lexalytics gives you the why. You can find information about the pricing upon scheduling a product demo. Hitech is a robust solution with services ranging from data analytics, market intelligence, data processing and a sentiment analysis tool. They pride themselves in extracting meaning from product and service review in the form of text, speech, emoji, images, visuals etc. No fixed pricing is available so if you’re interested in their services, use the contact form for any business inquiries with a few details of what your needs are. 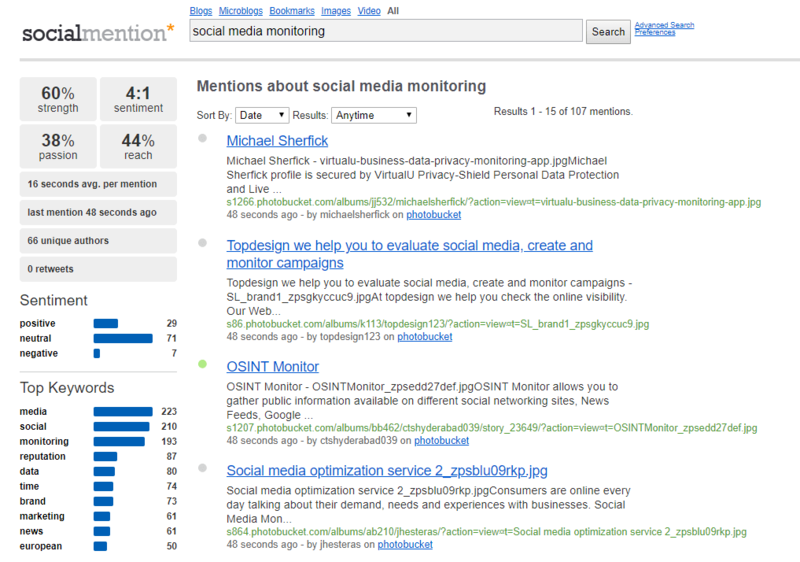 Social Mention is a free social media search engine that aggregates user-generated content from across the web. Following the information from their website, the tool monitors 100+ social media properties. You don’t need to set up an account to start monitoring a topic or your brand, which is pretty cool, but you also won’t be able to save your results for the future. Still, considering it’s a free tool it provides valuable information for those just starting with social media monitoring. 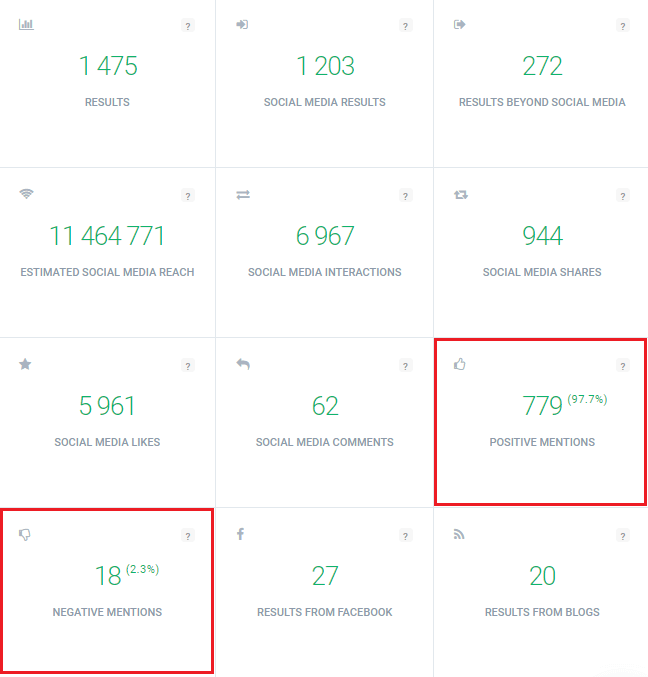 As you can see on the image above, the sentiment is one of the provided metrics that shows exactly how many positive, neutral and negative mentions of a given keyword were collected. On top of that, all mentions are accordingly marked with green, red or grey dots. Social Searcher looks like Social Mention on steroids. It’s a product with a variety of tools such as Social Buzz, Google Social Search, Media Monitoring, etc. You can use it without registering an account, but there are obvious benefits for creating one. In fact, you can stay on a free plan or alternatively pick one of the other three ranging from 3,49 to 19,49 Euro per month. 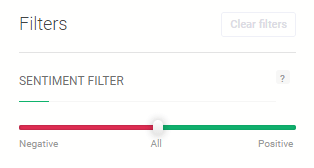 As far as sentiment analysis goes, each mention has green, grey or red dots assigned to them, that correspond to the sentiment of respective mentions. On top of that, you can apply sentiment filters so that you can only see a particular set of mentions. 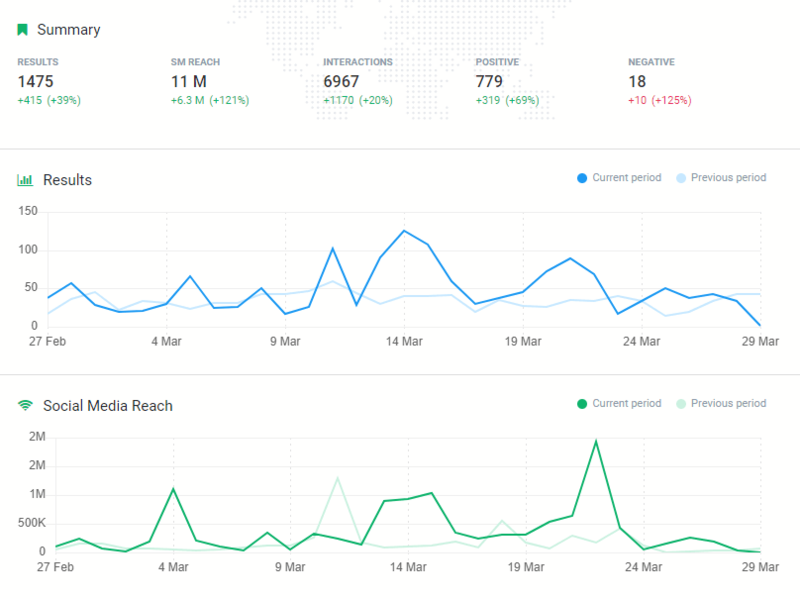 Detailed statistics give you an overview of the sentiment looks like on separate platforms. 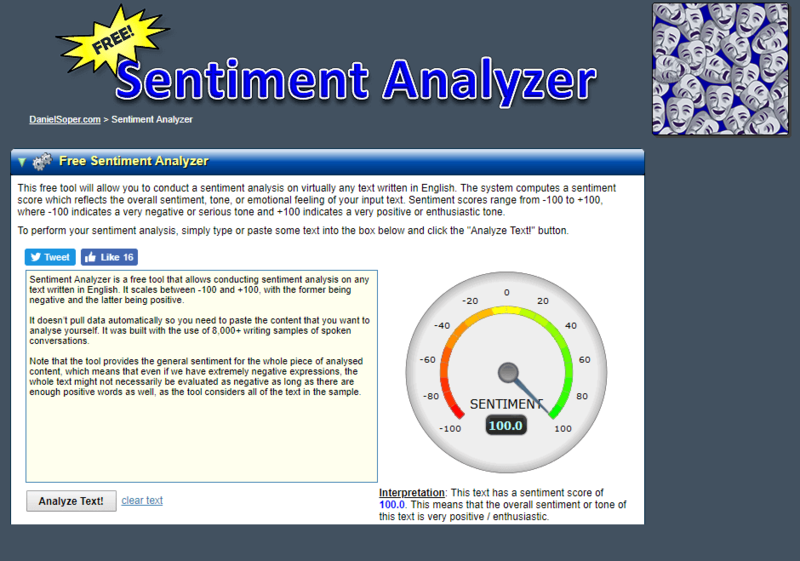 Sentiment Analyzer is a free sentiment analysis tool that allows conducting research on any text written in English. It scales between -100 and +100, with the former being negative and the latter being positive. It doesn’t pull data automatically so you need to paste the content that you want to analyse yourself. It was built with the use of 8,000+ writing samples of spoken conversations. Note that the tool provides the general sentiment for the whole piece of analysed content, which means that even if we have extremely negative expressions, the whole text might not necessarily be evaluated as negative as long as there are enough positive words as well, as the tool considers all of the text in the sample. Sentigem is pretty similar to Sentiment Analyzer that we’ve already discussed. You simply paste a block of text that you want to inspect, click Analyse, wham, bam and you’re done! As we learn, the tool is in the phase of public beta, which means the version we can test is still in development and encountering some errors is possible. The creators of the tool are proud of the speed with which Sentigem analyses content and I can vouch for it – I pasted huge chunks of text into the tool and got the results instantly! Sentistrength provides automatic sentiment analysis of up to 16,000 social web texts per second with up to human level accuracy for English. Unlike any other tool on the list, it’s downloadable software that is primarily a Windows program but works with Crossover on a Mac, Linux, and Android), However, you can see it in action in a web-based version as well. It boasts human-level accuracy for a majority of web texts in English. The reason why it uses two scores lies in psychology research that revealed people process positive and negative sentiment in parallel. As the maker of the tool says, keep in mind the results are not always accurate. It’s because they are guesses using a set of rules to identify words and language patterns usually associated with the sentiment. The Sentiment Analysis tool is just one of the products on the robust list from Meaning Cloud. Their Sentiment Analysis API analyzes the text by identifying individual phrases and evaluating the relationship between them. As far as the level of accuracy goes, it’s obviously never a 100%, mostly because of the number of factors a tool has to take into consideration while evaluating the sentiment. Sometimes you have to take the coverage at the expense of accuracy, and vice versa. Now, this one’s pretty cool! Even though it’s a sentiment analysis tool that will only help you with Twitter, it provides value on the spot, for free. What you need to do is to choose a keyword you want to analyse and simply put it into the tool. Then, keywords are pulled from Twitter and visualised on a number of different graphs, starting with the sentiment. When you hover over the dots on the graph, you get to read the actual content of the collected tweets. Apart from sentiment, you can analyse your tweets in terms of Topics, Heatmaps, Tagcloud, Timeline, Affinity, and more. What’s cool is that quero multiple keywords at once by using boolean operators. The way they estimate sentiment is based on searching tweets for words in the dictionary and combining those words’ pleasure and arousal ratings to estimate the general sentiment for a given tweet. Rapidminer is a data science platform that spices up analytics with artificial intelligence. As they say, Rapidminer unifies the entire data science lifecycle from data prep to machine learning to predictive model deployment. That includes text mining as one of the solutions Rapidminer has on offer. They emphasize how data is no longer just about numbers and figures but qualitative, textual content. The pricing structure seems a little bit complicated at first glance and is divided according to four different products, but you can test their text mining capabilities for 30 days for free. As their slogan goes, Hootsuite Insights provides richer social listening and helps you make smarter business decisions. Once again, it’s one of the many products in a bigger arsenal of the social media management legend. Sentiment analysis tool provided by Hootsuite helps you understand other people’s feelings about your brand. Once you find out what’s the people’s attitude towards your brand, you can filter your mentions by language, location and gender. This helps you build your market segment in a more structured and detailed way. Real-time access to data from more than 100 million sources in over 50 languages helps you monitor conversations across social, blogs, forums, etc. It’s one of a few products from Talkwalker, a social media search engine that helps you take care of your brand. As the landing page copy for the Quick Search states, you should find it helpful for finding content ideas, influencers and discovering trends. Talkwalker also claims Quick Search offers image recognition which I sadly haven’t tested. There’s no free trial you can sign up for right away but you can schedule a personalised demo. The cool thing is you can compare sentiment between two different brands or products so that you know how you stack up against competitors. As you can see, there are quite a few alternatives to choose from! Sentiment analysis tools can be invaluable as far as reputation management is concerned. Even using the free ones, with all their limitations, can save your business from potential PR crises and financial losses. 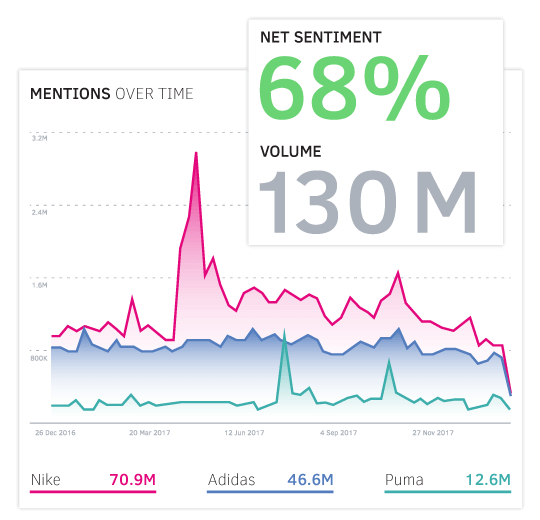 While we still need to be aware of how they can sometimes make mistakes while evaluating social mentions, there’s no better way to stay on top of the sentiment towards your businesses than using one of the tools on this list!